As they begin to develop Indian policy proposals, New Mexico Gov. Bill Richardson's strong record on government-to-government relations with tribal nations stands as a beacon. Shortly after declaring his candidacy, Richardson told Indian Country Today that if elected president, he would install a cabinet-level secretary of Indian Affairs. Given his record, this is less lip service than intention. In 2005 he appointed Jemez Pueblo native Benny Shendo Jr. as New Mexico's first secretary of Indian Affairs. It is the only state in the country that has a cabinet secretary and a department of Indian Affairs. Spoken commitment followed by action is the key to winning the increasingly critical Native vote. Apparently, providing quiet advise goes only so far. Indigenous Democratic Network (INDN's List) has scheduled a candidates forum, Prez on the Rez, for August 23rd at the Morongo reservation in southern California. It is the first such forum to be held in Indian country, and leaders from the federally recognized tribes will be present. All of the Democratic presidential candidates were invited to address the forum. However, Obama and Edwards have not agreed to attend--and according to the INDN's List website, Hillary has refused. Thankfully, Bill Richardson promptly accepted. Are our First Americans of such little value to these politicians? It smacks of the sort of arrogance displayed by Republicans when they refused invitations to address national Latino and African American forums this year. A Trillion $ U.S. Latino Market! According to a new study by the University of Georgia's Selig Center for Economic Growth, Multicultural Economy, African American buying power in the U.S. will rise 34 percent to top $1.1 trillion by 2012, up from $845 billion now. However, the Latino market will be even bigger, growing from $860 billion now to $1.2 trillion in five years. A new survey, Diversity in the Workplace (Report reveals discrimination against Latino workers (La Tribuna Hispana USA via IPA - 7.3.07), found that one-third of respondents had suffered discriminatory practices at work. 1) 15% of Latinos said that they have received a racist insult at work. 2) 25% of Latinos feel he or she is paid less and has fewer possibilities to progress in his or her career, compared to their white colleagues. 3) 26% of Latinos rank as serious discrimination or unequal treatment they've suffered. 4) 29% of Latinos say they suffer discrimination or unequal treatment at least once a week; 18% indicated that it occurs once a month; and 31 percent said that it occurs one to three times a year. 6) being passed over for raises (32 percent). Sound familiar? Had Enough? Visit ¡Ya basta! and sign the petition. In the spring of 2007, Congress engaged in a bitter debate on the issue of immigration reform. A fierce battle was fought between those who seek practical, comprehensive solutions to our broken immigration system, and those who favor only the enforcement of the broken status quo. The debate was conducted in an atmosphere poisoned by the followers of conservative talk radio and anti-immigration reform groups who complained loudly that any practical immigration proposal was “amnesty.” They managed to intimidate Congress into a stalemate. Until Congress picks up immigration reform again, the nation will continue to suffer the consequences of a broken immigration system. In the aftermath of a debate that had strong anti-immigrant and anti-Latino overtones, citizenship applications are at record levels, and new Americans are registering to vote and preparing to have their say in the next election. If recent experience proves to be a trend, however, the defenders of the broken status quo may come to regret their opposition to comprehensive immigration reform. In 2006, the Republican leadership...listened to the loud voices of immigration restrictionists and bet their political careers on...demonizing undocumented immigrants. [T]he American people were not impressed, and...Latino voters...offended—not to mention moderate and Catholic voters, who deserted the Republicans in droves. Many hardliners lost their seats and leadership positions. Unfortunately, as the recent debate has demonstrated, lessons were not learned. The general public continued to show steady support for immigration solutions that include enhanced border security, workplace and employer enforcement, and earned legalization for undocumented immigrants with a path to citizenship. Yet, Senate immigration hardliners continued to take their queues from the loud minority opposed to reform. Click here for a summary of recent public opinion polls on the immigration reform debate. Max Blumenthal documents the hypocrisy of young college Republicans that are staunchly pro-war but refuse to fight in Iraq. Blumenthal refers to them as Chicken Hawks or Cheney Republicans. Chicago, IL-- Senator Obama released the following statement in response to Judge James Munley's ruling that the city of Hazleton's anti-immigrant ordinance is unconstitutional. "Today's ruling by Judge James Munley is a victory for all Americans. The anti-immigrant law passed by Mayor Barletta was unconstitutional and unworkable - and it underscores the need for comprehensive immigration reform so local communities do not continue to take matters into their own hands. Recently, the U.S. Senate failed the American people by blocking progress on immigration reform for the second time in two years. We cannot put this off any longer. The ongoing problems with our immigration system are dividing our country, and distracting us from the work we need to do in other important areas such as health care, education, and jobs. We need to act urgently to create an immigration system that secures our borders and enforces our laws, reflects our best traditions as a nation of immigrants, and upholds the values and ideals that all Americans cherish. I have been fighting for that kind of system for several years now, and I will continue fighting for that kind of system until we pass comprehensive immigration reform once and for all." Tears rolled down the face of Jaime Lopez as he re-called the torrid memories of the Korean War. Mr. Lopez was a soldier in Puerto Rico’s 65th Infantry, a proud and dedicated band of fighting men known as the "Borinqueneers.'" For over 50 years, Lopez believed that the blood of over 700 fallen comrades, in the snow and hills of Korea, would never be recognized. The memories of the heroic men of the Puerto Rico’s 65th Infantry, who fought gallantly against Chinese and North Korean forces, fell into obscurity. But a new documentary, The Borinqueneers, by Noemi Figueroa Soulet sheds light on their stories and honors the forgotten heroes of Puerto Rico’s 65th. Latinos: A Legacy of American War Heroes focuses on the contributions and sacrifices made by Puerto Rico’s 65th Infantry and will draw on the PBS documentary The Borinqueneers, set to air on NJN August 6, 2007 at 8 pm. This documentary brings to life the phenomenal contributions of Latinos in general and Puerto Ricans in particular. The story of The Borinqueneers, which we should all learn, is a story like that of the Tuskegee Airman who served so valiantly. I’ve always heard people ask “What are the contributions that Puerto Ricans have made to this country?” This documentary answers this question. – Johnny Torres, Executive Director of Save Latin America Inc. It's always interested me why the good folks of the Netherlands (the Dutch) show such interest in American Taino. They visit the weblog at three times the rate of the Germans and the French--and over twice the rate of the Spanish. Actually, the Dutch have shown more interest in American Taino than have Latin Americans except for those in Mexico and Puerto Rico. While I honestly don't know, I suspect it has something to do with the openness and curiosity of the Dutch. As a crossroads of Western Europe, the Netherlands has always been a multi-lingual and multi-cultural society. For example, the Dutch never fail to amaze me with their fluency in English and other world languages. It probably also has something to do with the strong presence of the Dutch in the Caribbean. Latin Americans and people from the Caribbean have found their way to the Netherlands, settling there in growing numbers. According to the Migration Institute, some 25,000 Latin Americans were living in the Netherlands in 2005. And as one can imagine, there are children whose parents are Latino and Dutch. Actually, recently I completed an online survey on Taino parentage sent to me by a student studying at a Dutch University. The young woman is a Dutch citizen of Puerto Rican and Dutch heritage. And then there's this bit of information from the Netherlands: The Dutch love Salsa. Of course, we can't forget that the Netherland Antilles of Sint Maartens, Bonaire, Saba, Curacao and Sint Eustatius are Caribbean neighbors of Puerto Rico. This may explain actor Jimmy Smits' Puerto Rican and Dutch heritage. And Puerto Rico itself was captured by the Dutch in 1625 and held for a period of time. SOON after Héctor Lavoe, the great salsa singer, arrives in New York in the new biopic, “El Cantante,” he finds himself immersed in a vibrant scene in the Bronx: a nightclub crammed with bodies drenched in sweat moving to the pounding beat of congas. As the film, which is to open nationwide Aug. 3 and stars Marc Anthony as Mr. Lavoe, shows, it could have been any night in New York in the late 1960s, when dancing was a genuine physical manifestation of the energy of the streets. 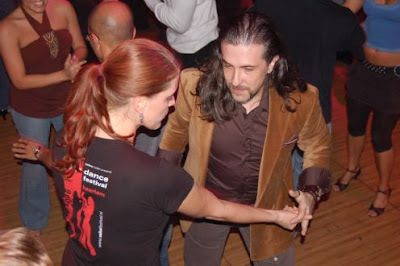 Besides the studios, salsa dancing is also thriving at salsa congresses, several days of workshops and performances that attract thousands of dancers from around the world. 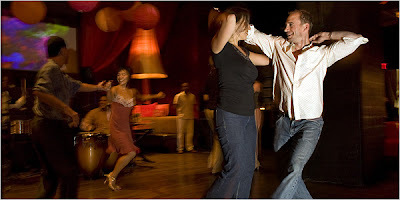 The original Salsa Congresso started in Puerto Rico in 1997; there are now congresses held in places as diverse as Los Angeles, Chicago, Britain, Romania, Dubai, Israel and Japan. New York’s annual congress is set for Aug. 30 to Sept. 2 at the Hilton New York. 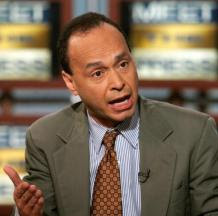 Congress should restart immigration reform process (by Rep. Luis Gutierrez, The Hill - 7.26.07) In recent weeks, we have heard a lot of tough talk from those who worked to stop immigration reform in the Senate. What we haven’t heard are any solutions. What do they propose we do now? As most people who are familiar with the legislative process understand, being against something is easy. Embracing heated political rhetoric is easy. Pandering to conservative radio hosts and playing into people’s fears is easy. You know what is not easy, and what was often overlooked during the debate, is the struggle and sacrifice of the immigrant who gets up at the crack of dawn each morning to go take care of someone else’s kids, or the young father working the midnight shift on a cleaning crew, or the woman picking vegetables in oppressive heat for 12 hours a day. You know what is not easy is worrying each day that your husband will not come home from work or that you will be swept up in a raid and your U.S. citizen children will be left helpless and alone. At the end of the day, that is what the immigration debate is all about, and why I believe it so is important that we keep fighting. The AP is reporting that Hazelton, Pennsylvania's anti-immigrant law has just been struck down by a federal judge. Hazelton's Republican mayor Louis Barletta pushed through a housing law intended to make it unlawful for "illegal" immigrants to live in Hazelton. The result however was that the laws and their enforcement has had a detrimental impact on all Latino residents, including legal immigrants as well as U.S. citizens of Puerto Rican heritage. Since many other towns adopted the Hazelton anti-immigrant housing codes, it's expected that those other laws will also be challenged. The U.S. immigration debate has given way to the biggest explosion of anti-Latino sentiment in recent memory. Using the pretense of fighting "illegal" immigration, racists across America are using the media and political offices to foment anti-Latino hostilities. While it's an honored American tradition for decent people to stand up to the bully racists, anti-Latinos have thus far gone unchallenged. If you believe that it's time to hold the anti-Latino bigots--and the institutions that support them--to account, please visit ¡Ya basta! and sign the ¡Ya basta! Petition. America will be better for it. It appears that priority issues for the general public and Latinos differ dramatically. A Wall Street Journal/NBC poll shows that 34 percent of Americans cite Iraq as the top national priority. The next closest issue was health care at 15 percent. Meanwhile, Latinos in a Bendixen & Associates poll see Iraq (tied with Health) as the second most important issue at 26%. The top Latino concern? It's education--by a significant margin. Forty-one percentage (41%) of Latinos see education as their number one concern. Additionally, 48% of Latinos rate the American public school system as poor or mediocre. Eighty nine percent (89%) see believe students are not held to high academic standards. Ninety-six percent (96%) believe that a lack of parental involvement in education as a major problem. And 87% believe that schools do not provide enough support for struggling students. Unfortunately, Latino concern for education is given plenty of lip service but few solutions are offered. Actually, Latino parents are regualrly depicted in the media and in the world of educational policy as not caring about education. And since we supposedly don't care, it's alright to give our children crappy schools. Ignoring Latino concerns is commonplace in America. For example, look at the current racist anti-Latino immigrant campaigns. Too few Americans seem bothered by the hostilities unleashed against Latinos as a result of the war against immigrants. How is it possible that the country's largest minority group with 44 million people can have their concerns systematically ignored? A recent Pew Hispanic Center poll sheds some light on this question. It turns out that only 13% of Latinos voted in the most recent national elections. Latino concerns are ignored because we don't vote. If you do not vote in America, you don't have power, which allows those that do to run roughshod over you and your interests. But there's power in numbers--and we have the numbers! Let's stop being patsies. Let's register to vote and then vote for those that best represent our interests. basta! weblog and the ¡Ya basta! Here is what the National Council of La Raza -- the biggest U.S. Hispanic organization -- should do at its annual meeting in Miami this week: draw from the experience of African Americans and Jewish Americans by launching an all-out campaign to expose anti-Latino bigots in the media, entertainment and politics. The recent immigration debate in the Senate, which ended with the defeat of a bill that would have given a path to citizenship to many of the 12 million undocumented workers, has given way to the biggest explosion of antiHispanic sentiment I have seen since I arrived in this country three decades ago. Most Hispanics feel the same way. A new nationwide poll by Bendixen and Associates says 76 percent of U.S. Hispanics agree with the statement that ''anti-immigrant sentiment is growing in the United States,'' and 62 percent say this phenomenon has directly affected them or their families. Indeed, in recent times we have heard statements on radio and television that go far beyond the boundaries of fair debate over the need to fix the U.S. immigration system, and that twist the facts in ways that make it difficult to believe in the good faith of those who make them. While the 44 million Hispanics are the biggest minority in America, you don't see the kind of nationwide protests, legal actions or calls for boycotts on a scale that you would probably see if these statement were directed against African Americans or Jewish Americans. When you visit the website of the NAACP, one of the first things you see is an 'NAACP `Stop' Campaign'' headline, which is a call to action against racism in the media. The Jewish Anti-Defamation League (ADL) has been exposing racism in the media since 1913. But when you go to The National Council of La Raza's website, you don't find a similar emphasis on fighting bigotry. The group's main theme is ''Ya es hora!,'' a voter registration drive conducted alongside the Spanish-language Univisión network and other Latino organizations aimed at adding two million new Hispanic votes for the 2008 election. La Raza President Janet Murguia conceded in an interview Friday that Hispanics need to do more to fight back against bigotry in the media. ''We do need to rethink our strategy; there is no question about it,'' Murguia told me. My opinion: The National Council of La Raza and its sister institutions are doing the right thing with their ''Ya es hora!'' citizenship drive. But they should also launch a nationwide ''Ya basta!'' campaign to identify, name and shame those who systematically bash Hispanics. If anti-Hispanic sentiment is allowed to keep growing, we will soon have an underclass of 12 million immigrants that will feel not only frustrated by not having a legal path to citizenship but increasingly insulted by the mainstream media. And social exclusion mixed with frustration can be a dangerous cocktail, as we've seen in the violent 2005 riots by Muslim youths in the suburbs of Paris. The time for Hispanics to say ''Ya basta!'' is now, before it's too late. Dozens of people lined up at City Hall on Tuesday for municipal identification cards, the first city-issued ID cards specifically designed to bring illegal immigrants out of the shadows and give them access to community services. The cards, available to New Haven's entire population, are meant to help anyone without a state- or federal-issued ID open a bank accounts and use other services that would otherwise be inaccessible. Advocates argue that if immigrants can open bank accounts, they will be less likely to carry large amounts of cash, a practice that makes them easy targets for robbers. An estimated 10,000 to 12,000 of New Haven's 125,000 residents are believed to be in the country illegally. "The simple straightforward purpose here is to build a stronger community," Mayor John DeStefano said. "You can't police a community of people who won't talk to our cops." The mayor said the federal government had failed to address immigration-related issues, forcing cities to find ways to manage them. New Haven is simply acknowledging the people who already live there, he said. It's reported in today's Newsday that Steve Levy has sent a 2 page letter pleading with the state legislature to pass legislation authorizing $300 million sales tax. He warns that he'll be forced to layoff scores of government workers and the the local hospitals will be "deluged with patients" if the tax is not immediately adopted. The ploy is supposed to pull at the heart strings of state legislators, but the case is being made by a guy who has been methodically dismantling the county's social safety net. Nonprofit contract agencies which the county relies on to provide critical services to county residents have been subject to a campaign by Levy to wring 100s of millions of dollars in savings that otherwise would go to services. Many of the agencies are on the brink of closing as a result. I suspect that the state legislators are well aware of Levy's irresponsible stewardship, so his pleas probably sound quite hollow. See Levy pleads to extend Suffolk sales tax. I'll be blogging the YouTube/CNN Democratic Presidential Forum in Charleston, South Carolina. It'll be the first debate of its kind ever in which all of the questions are asked by voters via YouTube and televised on CNN. Answering the questions will be the Democratic presidential contenders who'll appear on stage in Charleston, site of next year's first Southern primary. 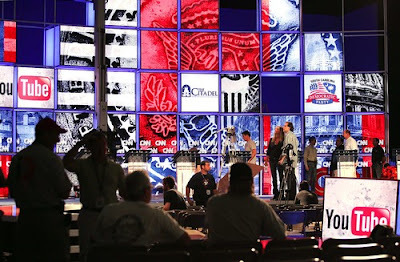 Republicans will face the YouTube questioners at their September 18th debate in Florida. I'll be watching to see if the YouTube piece allows for a more meaningful debate or if it'll prove to be yet another television gimmick. I'm also curious to see how the issues of immigration, race, education and relations with Latin America are handled by the moderator and the candidates. The controversy heading into the debate is that the forum will be "moderated". That is, Anderson Cooper (and his team at CNN) get to choose the questions from the YouTube submissions. They are free to use their journalistic judgement in deciding which questions to allow. To see all of the questions--those Anderson Cooper will pick as well as those he'll ignore--visit YouTube's political vlog CitizenTube. While the anti-Latino immigrant lobby is overjoyed at their success in killing the so-called Border Security and Immigration Reform Bill, many on the pro-immigrant never lifted a finger in support of that bill--and they, too, were pleased by its dismissed. The mainstream media reported the proposal's defeat as a defeat for the pro-immigrant side because a few visible organizations such as the National Council of La Raza signed on as supporters. But groups like La Raza are longstanding inside the Beltway operators with a range of political and economic interests--and a history of engaging in "practical" politics. Their calculation was clearly that a bad bill was better than nothing. However, the people on the front lines of the immigration divide never had much love for the mess that was being sold in Washington as immigration reform. For example, Enrique Morones of Border Angels and his fellow activists support a humane and just solution to the immigration problem--and they view the defeated proposal as offering neither. In their view no bill was better than a very bad one. These are some of the larger organizations that called for the defeat of the bill: Labor Council for Latin American Advancement (LCLAA), the League of United Latin American Citizens (LULAC), the National Alliance of Latin American and Caribbean Communities (NALACC), the Mexican American Political Association (MAPA), Hermandad Mexicana Latinoamericana and the William C. Velasquez Institute (WCVI). Morones rightly observes that "...true change for justice takes time"-- and that no amount of political expediency should be allowed to compromise what's right. His prescription for a human and just immigration reform? As a human rights activist, Morones advocates marching forward against the stiff wall of bigotry and hate erected by the right. He advises "…let’s continue to peacefully lobby, educate, organize, etc…lets register more people to vote…protect all our people as humane reform will take place." BTW: Morones has paid a heavy price for standing up for what's right. The San Diego Padres relieved him of his executive position for acting on his civic and moral duty to save people from dying at the U.S.-Mexico border. 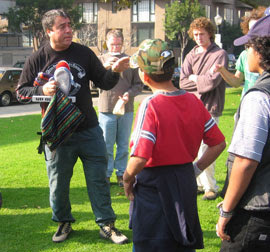 Click here for more on Enrique Morones and his humanitarian organization Border Angels. 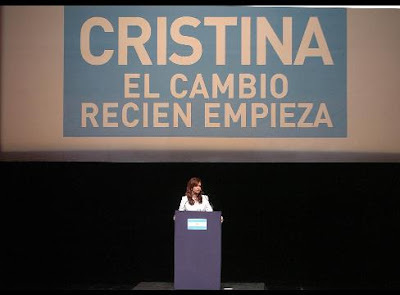 Argentine First Lady and Senator Cristina Fernandez de Kirchner heads into her first day of campaigning for president, pledging to extend the economic agenda of her husband that she said rescued the country. Fernandez may not have done Hillary any favors with her video. While I could not find the video on the Internet, I suspect that it'll be a great interest to Hillary's presidential competitors. Recall that Hillary was heavily criticized for her early "socialistic" health care plan, and more recently, for threatening to have oil companies stripped of their profits. Meanwhile, Chavez has nationalized oil and is pursuing Cuba-like health care system. That a prominent foreign leader such as Fernandez even suggests an association between the two allows Hillary's foes to paint her as a sort of domestic Chavezista (or even a Peronista). 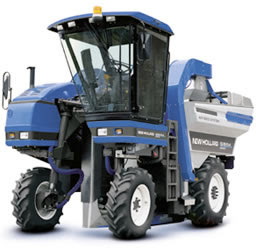 Oregonians for Immigration Reform love the new grape harvester machines but it can do, with a crew of just three, what it used to take 34 migrant workers 1 hour. Hip, hip, hooray! they're all shouting. Interesting logic since OIR's embrace of the harvester, according to Andrew Leonard in Grape harvesters of illegal immigration wrath (Salon - 7.21.07) appears to make a lie out of their key anti-immigration plank: that Latin migrant workers are taking jobs from Americans? "Reducing the number of available 'stoop labor' jobs without simultaneously beefing up investments in education and job training and social safety net protections -- not just in the United States, but everywhere -- seems a bit short-sighted. If technological change really is contributing significantly to growing income inequality then the world is facing much bigger threats than anything posed by 'illegal' labor." Peak harvest season is approaching in much of the country, and the biggest issue on the minds of many growers isn't the weather but how in the world they'll get their crops from the vine or off the tree. Thanks to Congress's immigration failure, farmers nationwide are facing their most serious labor shortage in years. Americans can all blame nativists Lou Dobbs, Tom Tancredo, et al, the next time they're shocked by the prices at the grocery. ORLANDO, Fla. (AP) - They are Florida's "other" Hispanic voters. After Cuban-Americans, Puerto Ricans make up the state's largest Hispanic population and its most politically independent - key swingers in a swing state. Both parties seek to claim them. Democrats point to Puerto Ricans' traditional alignment with their party and tout their potential to counter the Republican Cuban-American vote. Republicans boast of the more business-oriented Puerto Ricans who increasingly call central Florida home. But both parties are loath to admit one uncomfortable fact: as U.S. citizens, Puerto Ricans are the only Hispanic immigrants in Florida who can automatically register to vote, yet more often than not, they don't. "We have been working for years to get people more involved, Democrats, Republicans, the Puerto Rico Federal Affairs office, and it has been disaster," said Kissimmee County Commissioner, Republican Carols Irizarry, one of Florida's few Puerto Rican elected officials. In the last decade, Florida has passed New Jersey as the No. 2 state for mainland Puerto Ricans, behind New York. The number of Puerto Ricans in Florida was estimated at 645,000 in 2005, up 160 percent since 1990, with the majority settling in the center swath of the state from Tampa to Daytona. A new book out in October details how the current administration’s policy towards Latin America is actually creating the very immigration issues President Bush is fighting to solve. Saving the Americas: The Dangerous Decline of Latin America…and What the U.S. Must Do, by Pulitzer Prizewinning Miami Herald syndicated columnist Andres Oppenheimer, due out on October 9, 2007, highlights the Bush administration’s failure to reach out to its own neighbors in order to create a stable environment for the people of the United States. “When it comes to everyday issues that affect most Americans—whether immigration, trade, the environment or, increasingly, energy—no region in the world has a bigger impact on the United States than Latin America,” writes Oppenheimer. 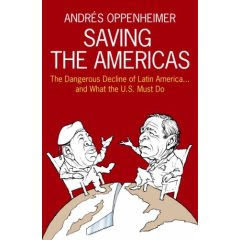 As an acknowledged expert on Latin America, Oppenheimer uses his experience and reporting skills to show how this region is becoming increasingly less important on the world stage, and the resulting negative effects on the lives of Americans. By comparing the successes of China and the Asian Bloc to Latin America, Oppenheimer clearly demonstrates how a region can rise from economic and political obscurity, to become a major world power, and a potential liability for the United States. Is Barack Obama the next JFK? At first glance, the Democratic nominee for president in 1960, John Fitzgerald Kennedy--the millionaire Caucasian war hero for whom I worked for eleven golden years--seems notably different from the most interesting candidate for next year's nomination, Senator Barack Obama. But when does a difference make a difference? Different times, issues, and electors make any meaningful comparison unlikely. But the parallels in their candidacies are striking. [W]e’ve seen...militia members arrested because they were hoarding weapons and were planning to attack Latinos. A radio host on 1070 AM was telling people...that what we can do to undocumented persons is to go and shoot all of them. ICE has conducted early morning...raids on Haitians...in which parents have been arrested and detained for deportation without warning and in the space of five minutes removed from their U.S.-born children and spouses. Haitian Women of Miami, Inc.
[I]t's creating a lot of stress on our kids. One mother went to reissue her work permit and she was deported. She left three children at home. Since the Senate vote, people are so disappointed. There are so many people receiving deportation orders and they were hoping that this would have bought them some time. The fear is palpable. The current immigration debate has created an openly hostile environment against immigrants in Georgia. 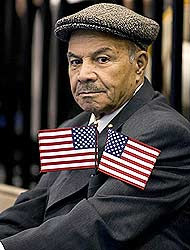 There is confusion about the implementation of [anti-immigrant] state law that went into effect July 1, 2007. [A] new 1000-plus detention facility...opened up in Lumpkin, Ga. last year. Immigrants...detained from raids in other states...are transported to Stewart Detention Center even though their...families do not reside anywhere close to the detention facility. Gwinnett County passed an anti-immigrant ordinance. We’re afraid that it may cause extreme discrimination, and it may be unconstitutional. We are concerned that it is going to be devastating to the community as the immigrant community is increasingly targeted. In one county, two white people wearing swastikas attacked a Latino man at his house. Kentucky Attorney General...released a statement...in which he said that it is okay for police officers to check for citizenship status in the course of an arrest. There are...questions on what "in the course of arrest" means. People are concerned at this point. There are over 20 bills on immigration waiting to be voted on in the North Carolina General Assembly that are all anti-immigrant. Charlotte is fairly conservative when it comes to immigration issues, and the debate has given a platform for angry rhetoric. As a result, pro-immigrant voices are intimidated and people are keeping a low profile. We have an ordinance that went into effect July 1...after... Hazleton...and Beaufort County, S.C. The ordinance was passed by one vote. The anti-immigrant sentiment is not just directed at Latinos; it’s affecting the Asian and Muslim communities, anyone who doesn’t look like they are from here. The environment on the state level...is quite hostile. The state legislature considered 44 anti-immigrant bills this year, three of which passed. They may know the issue and want to do something about it, but the language barrier means that only a few young professionals or people who grew up here get involved. Note: This article is written by a 17 year old young man of Puerto Rican and Quechan Indian heritage. He writes about how his confused identity led him into passing for Mexican on the streets of LA and getting deeply involved gangbanging. It has been his search for his true native identity that has rescued him. He now lives in San Francisco where he's finishing high school and he next wants to go college. His goal? To return to LA to help other young people find their true paths. But how many more of our young people are hurting themselves or others due to their confusion? How many of us older folks walk around wounded inside because we're still confused? Isn't it time for you to learn to love your native roots? My mom is Quechan Native American and grew up in the Echo Park area of Los Angeles, while my dad was born in Puerto Rico and grew up in New York. So, I have Indian from both sides. One side is Taino Indian, the people who were raped by Columbus and whose land he stole. Quechan Indians are from Arizona. Their land is right on the border of Mexico and Arizona and was occupied by the Spaniards. From what I’ve read on the internet, the Quechans fought the Spaniards. They weren’t wiped out like many other tribes were. It makes me proud that they fought the conquerors. If I were around back then, I would have been one of the main warriors, wiping out every European I came across. My mom’s immediate family has lived in L.A since the early 1900s, while the rest of her family lived on the reservation in Arizona. In L.A., they struggled when growing up because they were Indian and they grew up in the barrio. The Pachucos – Mexican gangsters in L.A during the 40s, famous for wearing Zoot Suits and fighting with sailors – used to beat up my grandma and my mom’s uncles just for being Indian. That just shows how ignorant people are about their own history and how their race came into existence. In The Real Bill Richardson (Reason Magazine - August/September '07 Issue), David Weigel wonders if Bill Richardson is a libertarian Democrat? Richardson isn’t driven by libertarian principles. He’s simply a realist: more impressed by markets, and less impressed by central planning, than any other Democrat in the race. By his own account, Richardson is a "market-oriented Democrat” -- a distinction that sets him apart from his party's other presidential hopefuls. His libertarian streak also aligns him firmly with foundational philosophy of Mountain West and Pacific coast voters. While Richardson is not a dogmatic politician, Weigel notes that in 2005 the libertarian Cato Institute gave Richardson a B on its biennial gubernatorial Fiscal Policy Report Card—a higher grade than those given to Florida’s Jeb Bush and Massachusetts’ Mitt Romney. Richardson's run as a market Democrat is an odd strategy for winning the Democratic party's presidential nomination, but it may be brilliant if the goal is the VP slot under a nominee that's a Northeast liberal. A couple of days ago I posted a short video of Haile Rivera prior to his big dinner date in DC with Barack Obama and three other guests. Below is a video of that dinner. It's an interesting 10 minutes of Obama chatting over steak and potatoes with four lucky and very promising young Americans. Oh, and the food looks pretty good, too Although I'm not sure what the commotion is about at the end; perhaps a busboy unhappy with the state of DC politics. Voter disgust setting stage for independents in '08? If 83% of Americans say the Democratic-controlled Congress is doing only a lousy job, and 66% give low marks to the Republican administration (Zogby), isn't that like a massive S.O.S to an independent like Michael Bloomberg? These historic levels of unhappiness with the president and the congress gives an opening to beltway outsiders with genuine independent streaks. Unfortunately, the rigged rules of the two party system will also promptly dispose of such candidacies within the parties--and make it nearly impossible for people working outside of them. The major parties prefer to serve up the uninspiring candidacies of the common-denominator types, e.g., Kerry, Bush I, Bush II, Dukakis, Mondale, et al. But this year could be different. The independent vote within across party primaries will be more formidable than ever due to state balloting changes--and there's a strong possibility for truly competitive independent candidacies to emerge. The bottom line? If the public's current 'pox on both houses' sentiment holds through next year's federal elections cycle, we may well see the first real boomlet of independent victories of this century. Leading Latino conservative Herman Badillo writes (Immigration Overhaul, NYSun - 7.18.07) that it's a shame that immigration reform went down the tubes, but that the proposed bill would've been ineffective anyway. Because, he says, the bill ignored the propellant for immigration and desperate border crossings in the first place: the dire economic circumstances of so many South of the border. While it disappoints me that Badillo, in his quest to prescribe solutions to some of the problems besetting the Latino community, joined ranks with some of the very people that helped kill immigration reform in the first place, I give him credit for focusing attention on the political/economic circumstances in Latin America. Badillo offers that any of us would jump at the chance to cross national borders if doing so meant living in the relative wealth of American poverty versus the hellish poverty of the Latin America poor. He's right. Badillo believes that what Mexico and most of Latin America need is an economic overhaul. Here, here! He suggests a package of technical assistance, improved educational opportunities and financing--a sort of Marshall Plan for South of the Border that leverages the assets of international development agencies. Badillo also calls for institutional reforms including steps to remove the systemic corruption that exists in many Latin American regimes. Although he fails to mention America's historic and continuing support of often brutal, corrupt and elitist regimes. While Badillo's proposals are worthy of serious consideration, my question is, Where is the American will, vision and leadership to come from given the anti-Latino/immigrant hysteria of the times? Arizona's English-learners spend most of their school day with kids who already know the language. All kids still learning English will have to spend at least four of their five or six class hours in new courses in English grammar, phonetics, conversation, reading and writing. It's a big change in the way the state's K-12 schools will teach English to about 135,000 kids, whose primary language is most often Spanish, but also Navajo, Somali and dozens of others. Many of those kids now get about an hour of English a day. "More time on task. That's a tried-and-true educational standard," said economist Alan Maguire, who headed a task force that created the state's new language-learning requirements. "If you want to learn how to play the piano, what do they tell you to do? They tell you to practice." The new model is based on a law passed last summer. Supporters say the state is finally providing a structured language-learning model that replaces a dizzying variety of instructional methods used with varying success. But critics warn that it is an expensive plan that segregates English-learners for most of their school day and limits their lessons in core subjects, such as math, science and history. It also will cut back on their socializing with peers. Now what? That is the question that many immigrants in the United States are asking. The failure to get a comprehensive immigration reform through Congress was seen by millions in the Latino community as a direct attack. The negativity surrounding the debate reverberated throughout the community, affecting not only undocumented immigrants but legal residents as well. But the issue goes beyond immigration reform. There is a generalized feeling among Latinos that without political participation, their voice is simply lost amid the anti-immigrant rhetoric. If they want respect, if they want elected officials to take notice of issues that concern them, they need to have the power to put them in office or vote them out. Loosely translated, that means "The time is now," the time to go full-throttle with a campaign to motivate legal permanent residents to become citizens of the United States and to help guide them through the process. According to Reluctant Neighbors (Canvas - July Issue), relations between ethnic groups on Long Island [New York] haven’t always been happy. Here’s how they stand now. A cross is burned in the yard of an interracial couple. In a nearby town a Haitian immigrant also opens his door to face a ﬂaming cruciﬁx. Two Mexican men are kidnapped, taken to a warehouse and beaten within an inch of their lives. One nearly loses his hand from the knife attack he endures. Elsewhere, a Latino man is whipped by his employer for not working hard enough. A hanging noose is strung up in the management area of a factory in order to warn African-American employees to keep out. And all in New York's Long Island. Strict racial and class segregation, as well as institutionalized racism, are part and parcel of life on Long Island. African Americans and Native Americans live America's version of Apartheid here, regulated through an endless maze of local codes and customs. The Bantustans (such as Roosevelt, Hempstead, Wyandanch, Brentwood and Shinnecock) feature crowded housing, poor government services and failing public schools. And minority enclaves lack political representation due to the use of at-large election districts. It's through this historical racial and class frame that anti-Latino immigrant pograms are properly understood. Long Island's historic minorities--African Americans and Native Indians--have been oppressed for so long--with violence and local laws deployed to keep them in their place. And always the demand that they suffer quietly. That racist legacy is in part why the influx of Latinos into Long Island has sparked such a negative reaction. Latinos, particularly their more visible day worker variety, are seen as wantonly breaking the island's race and class rules. Unable or unwilling to abide by elements of the code, Latinos are guilty of upsetting the status quo--and for that they're being punished. Latino disobedience is why island politicians Peter King and Steve Levy have been given free reign in the use of governmental force (and then some) to sanction the Latino code breakers. Witness how a majority of white Democrats and Republicans, liberals and conservatives, have closed ranks behind King and Levy as enforcers of the code. Cockfighting as a 'cultural right"? 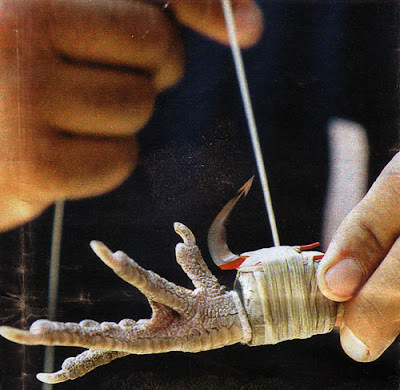 ISLA VERDE, Puerto Rico — With cockfighting about to lose its last bastion in the United States, animal-rights activists are training their sights on Puerto Rico, a U.S. territory where the blood sport is both beloved tradition and big business. Cockfighting is illegal in 49 states, and the governor of Louisiana—the pastime's last U.S. refuge—signed a law Thursday that will make it a crime to fight birds beginning in August 2008. New Mexico banned the sport June 15. But Puerto Rico shows no signs of following suit. Cockfighting is so entrenched that the territory's legislature recently approved a bill establishing it as a "cultural right" of islanders. Also see Louisiana to be last state to ban cockfighting. Cockfighting's "Days Are Numbered" in U.S. The answer is that my family made the same journey that your families, and all the other families in your communities, made. They just made the trip a couple of generations earlier. And, as you know, timing is everything. People who made the trip more recently–like your readers and listeners–cannot forget for a minute where they came from and how they got here. Not in Georgia, not in the South, not in 2007. But I do know there’s been a tremendous influx of immigrants into the Southeast over the past 20 years. • If you look at places where the Latino population soared by more than 300 percent between 1980 and 2000, 11 of 18 of these so-called “hypergrowth” areas are in the South. Atlanta will probably never have Hispanic or Asian communities the size of those in Los Angeles or New York, or even a black community as big as New York’s. But in terms of trends, all three of these populations are increasing rapidly in Southern metropolitan areas. Raleigh, in North Carolina, Nashville, Tennessee, and four metro areas in Florida. Atlanta, Orlando and the Tampa-St. Petersburg area. • Black populations are also increasing in many parts of the South. Diversity Spreads Out emphasized a phenomenon you no doubt already know about: immigrant communities are shifting away from inner cities and coastal port cities and toward suburbs and inland areas, where the cost of living is lower. Cultural diversity is coming to small towns and rural counties: University of Georgia researchers found that during the 1990s, Hispanic populations soared by nearly 300 percent in 62 Georgia counties. On June 21, 2007, the Barack Obama campaign announced the 4 winners of a contest to have Dinner with Barack Obama. Below is a video of Haile Rivera speaking from the streets of the Bronx and on the train to D.C. for his July 10th dinner date with Barack Obama. He's a charismatic young man with a future as a civic leader. There was a major traffic jam in La Isla of del Encanto yesterday. A truck overturned de Diego highway in Bayamon and everything came to a dead stop for hours. Weather: 90 degrees; high humidity. 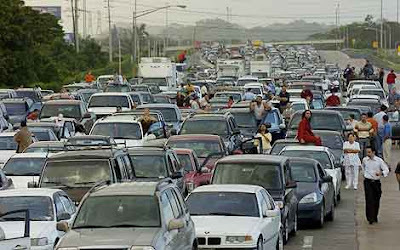 Of course, the San Juan Metro area is a major urban center with lots of cars, so traffic jams are inevitable and frequent. What the photo reminds of, though, is the sense that there really aren't any road rules on the island roads and highways--at least none that I've been able to discern in my many trips there. 1) running red lights - This happens alot and when I asked locals why, I was told that it's an accepted practice especially at night and for women. The idea is that if a you wait for the light to change at certain intersections and times of the day, you are more susceptible to carjackings or worse. However, the fear of carjackings and rapes seems to give many motorists to run red lights anytime there's not a police patrol in sight. Question: If carjackings and rapes of motorists is causing people to run red lights, shouldn't the PR police come up with strategies that allow for the to re-establishment of public safety on the roads? 2) driving on shoulders - This must be one of the most dangerous and aggravating practices ever. It's routine for drivers stuck in slow traffic to execute pass-bys on the shoulders of highways. Sometimes the perpetrators are those hyper-annoying young duds with the dressed up boom boxes on wheels; but often the violators are average looking Puerto Ricans just doing what's done. Police are often shoulder drivers there, too. But they often have no choice. I have rarely observed PR drivers voluntarily clearing a lane--even for emergency vehicles. Instead, you're more likely to see ambulances, fire trucks and police cars attempt dangerous maneuvers such as driving at high speeds on grassy medians, sloping shoulders, sidewalks and even off road. 3) driving slow in the fast lane - This is one of the worse practices ever. Without an understand of the rule that slower vehicles stay to the right in order to allow others to pass, you simply have chaos--and that's what you have across PR. What's worse is that a lot of slower drivers choose to drive in the left or fast lane because the right lanes are usually in disrepair due to the heavy pounding of truck traffic. Highways in PR are typically cement slabs which fall out of alignment with the tropical rains and the pounding of heavy trucks. Sensibly, PR drivers gravitate to the left lanes in order to avoid the constant thumping and misalignments caused by the right lanes. The problem is that slow trucks use the right lanes and slow cars use the left lane, blocking all other traffic from passing. I've driven on roads where the highway ahead is clear, but I can't get around a slow truck on the right and a slow car on the left, and no matter what you do, blink your lights, blow your horn, the driver won't give you the right-of-way. It's not that they're trying to be annoying, it's that they do not know the concept of right-of-ways. 4) stealing tolls - How often have I seen this? You're edging closer to a toll booth and you hear one, two, three or more sirens go off as brazen drivers race through the tolls without dropping the required 10, 15 or 25 cents into the collection boxes. I've never seen a toll work respond in anyway thus encouraging the practice. 6) stopping to chat - Getting around town is tough enough but it's made much more difficult by the number of drivers stopping to chat. May be it's just me, but I've had to wait way too many times behind some dude stopping in the middle of the road to chat with another motorist or persons on the side of the road--usually a young woman. And don't dare ask the dude to move. If you do, you'll probably incite the dude. 7) dead car lights - It gets dark, really dark, in the Caribbean and island highways are rarely lit. So having a full set of operational auto lamps is really important to road safety. But in PR it seems that every second or third car operates with one or more dead lamps. What I think is a motorcycle coming towards me is often a one lamped car. And then there are the hair raising moments when you're driving along and suddenly you're confronted with a car without any lights. 8) what are directionals? - Turning or changing lanes without a signal is a pet peeve of mine and it's a problem where I live--especially among the young dudes that love to play chicken by darting in and out of lanes. But using directionals seems to be optional in PR. 9) who needs road signs and directions? - I have never understood how an island so dependent on visitors could do without clear and accurate road signs. It's either missing at key junctures or it's inaccurate. And forgets maps. They're either outdated or only partially correct. With missing signs, inaccurate maps, dead ends, construction, etc., asking for directions becomes necessary. But getting clear and accurate directions is a major challenge in PR. Instead of using standard road cues, e.g., the number of street lights, the number of streets, left or right, North, South East or West, actual street names, route numbers or distance measures (miles, yards, etc. ), people will refer to the original name of a route, mention landmarks familiar only to the locals and use hand gestures to indicate directions. The funny things is that the people may very well know the way but they can't explain it. I'm sure there are more PR driving annoyances. I'm curious to learn about any others you readers have experienced. Forward them and I add them to the list. Edson Arantes do Nascimento Pelé, or simply Pelé, the King, rang the opening opening bell at Nasdaq in New York's Times Square on Wednesday July 11, 2007. Pelé was in town to kick-off Fútbol Mundial's children's LEA literacy program, a program to encourage children to read first and then play. While playing for the Brazilian national team in World Cup competitions in the 1960's, Pelé electrified the soccer world with his speed, acrobatics and sheer magic. Pelé came out of retirement to jump start U.S. professional soccer. In 1977 he led the New York Cosmos to the U.S. championship. Pelé, now 66, is coach of the Brazilian team which just made it into the finals of the Copa América, the soccer tournament of the Americas being held in Venezuela. Brazil faces off against favorite Argentina on Saturday, July 14. The following is a short video produced Fútbol Mundial for the special occasion. America derives an enormous benefit from its undocumented servants. They boost the nation's wealth, shore up government programs, perform the most laborious and dangerous jobs, serve as scapegoats on-call--especially America's slacker class, fight and die in our wars, and remind us that some people still value hard work and families. They also perform a tremendous benefit to their home countries. For example, Their migration North allows the elites to live in higher on the hog without having to support a social programs for the poor and working classes. And they return money, remittances, from their meager earnings to support their families. Of course, we all know this already, right? But here's a benefit I hadn't thought about: migrants as recession buffers. Yes, consider the current recession in residential construction. According to U.S. government, data residential construction has fallen some 25 percent since early 2006. But employers shows a drop of less than 2 percent in jobs in the sector. There are different theories for this phenomenon in Is Mexico paying for U.S. housing downturn? (Reuters - 7.12.07), but it's clear to me that Latino migrant workers allow construction to expand and contract to meet market demands. As markets tighten, migrant workers are shed, company expenses are slashed, allowing Citizen owners and employees to weather the downturns without as much as scratch. Latino migrants as human recession buffers! If all undocumented workers were removed from Arizona's workforce, economic output would drop annually by at least $29 billion, or 8.2 percent, according to a report by the University of Arizona Udall Center for Studies in Public Policy. It also found that Arizona's documented and undocumented immigrants generate nearly $44 billion in output annually. The study also looked at what would happen to specific industries that lost most non-citizen workers. The figures assumed unskilled citizens would fill some positions. • $6.56 billion in lost construction output. • $3.77 billion lost in manufacturing. • $2.48 billion lost in service sectors. • $600.9 million lost in agriculture. "Filling the specific jobs in question would require large numbers of low-skilled workers, and the U.S. education system produces relatively few of them," Gans said. "There simply aren't enough additional workers in Arizona to fill the jobs." There are an estimated half-million [undocumented] immigrants in Arizona. With the collapse of public support for the failed War in Iraq evident everywhere, it appears the administration is back to its tried and true tactic: increase the fear factor. Their logic is clear: more fear = more war funding. - Yesterday, Homeland Security Secretary Michael Chertoff said--without any evidence--that he has a gut feeling that Al Qaeda is about to act. - Earlier we also saw news reports of Al Qaeda cells infiltrating into the U.S.
- And just today "U.S. counter terrorism analysts" leaked to the press that Al Qaeda is back to its pre-9/11 operating capabilities. So while the propagandists are working over time to raise the public's fear quotient, the president went before the media to say: 1) Al Qaeda wants to kill us; 2) the surge is working; and 3) the surge is really only 3 weeks old; 4) we should wait for General David Petraeus' report in September before deciding to change anything; and 5) the Congress should just fund the war and stop trying to run. 4) and anti-war Democrats and Republicans are unAmerican. So that's the strategy. Raise the public's fear level with aid from the screechers and then brow beat the Congress to back off--and given the backbone of this congress and the MSM to fall silent at critical moments, it'll probably work. Question: If Al Qaeda has regrouped in their mountain perch along the Pakistan and Afghanistan border, and it's from there that they're hooking up yet another devastating attack on America's homeland, why is it that we have 160,000 troops, costing us $12 billion a month, in Iraq? The experience of Latinos in the U.S. Army has rarely been portrayed in film. Now comes The Borinqueneers (pronounced Boh-rin-keh- neers), the never-before- told story of the 65th Puerto Rican Regiment, the only all-Hispanic unit in the history of the U.S. Army. Narrated by Hector Elizondo(Chicago Hope, Pretty Woman), this compelling 78-minute documentary relies on interviews with the regiment's veterans and rare archival footage to trace the unique experience of the 65th, culminating in the Korean War and the dramatic events that would threaten its very existence. The world premiere screening will take place on July 13th at the Newark Museum in Newark, NJ, with other screenings scheduled in various other cities. PBS stations nationwide will begin broadcasting a one-hour version of the program in August (check local listings). Named after "Borinquen," the word given to Puerto Rico by its original inhabitants, the Taino Indians, the Borinqueneers formed a tight-knit unit bound by a common language and a strong cultural identity. First-time director and producer Noemí Figueroa Soulet spent eight years researching the story and locating veterans of the regiment, some of whom have since passed away. Through their voices, the documentary explores the unique history of the 65th Regiment and illustrates many of the issues surrounding the U.S. relationship with Puerto Rico and the broader Latino experience. "Puerto Ricans occupy a very special place in the history of the U.S. Army," says Figueroa Soulet. "As a former colony and now a commonwealth, we don't have the right to vote in U.S. elections, and yet we serve in the military and we can be drafted." The Borinqueneers will be released in DVD on August 15, 2007. Are Longtime Bronx Friends About to Become Rivals? (by Jonathan P. Hicks, NYTimes - July 11, 2007). They have been friends for so long that neither can remember their first encounter. When Joel Rivera was born, Ruben Diaz Jr. was about 6 years old. Their fathers have been active in Democratic politics in the Bronx for decades, and the sons have followed in their footsteps: Mr. Diaz winning a seat in the Assembly and Mr. Rivera in the City Council. They play basketball together and have been allies on virtually every political issue. 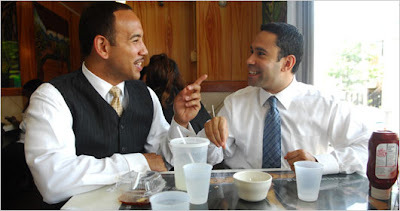 But they are also two ambitious politicians who are considered the up-and-coming leadership of the Bronx. And their ambitions are leading them to a potential head-to-head competition that could drive a wedge between their prominent families. Both men want to run for Bronx Borough president. Question: What becomes of the current Bronx Borough President Adolfo Carrión Jr? Many believe he has his sights set on becoming NYC's next mayor. While the competent and charismatic Carrión may be just the right person to lead NYC into the next decade, perhaps he should be thinking of Hillary Clinton's U.S. Senate seat if she's successful in her presidential run. The Democratic Party coalescing behind a Carrión senate bid would be just the antidote to the negative tensions created by the foes of immigration reform. July 10, 2007 (TurtleIsland). 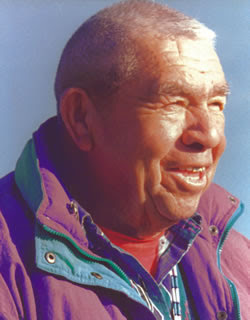 Corbin Harney Spiritual Leader of the Western Shoshone Nation crossed over July 10, 2007, 11:00am, in a house on a sacred mountain near Santa Rosa, CA (Turtle Island). Corbin dedicated his life to fighting nuclear testing and dumping. Over his lifetime, Corbin traveled around the world as a speaker, healer and spiritual leader with a profound spiritual and environmental message for all. He received numerous national and international awards and spoke before the United Nations in Geneva, Switzerland. Corbin also authored two books: “The Way It Is: One Water, One Air, One Earth” (Blue Dolphin Publishing, 1995) and a forthcoming book, “The Nature Way”. For Victor Toro, last week seemed like any other week in his life as one of the best-known advocates for immigrants and other dispossessed people in New York City. He met with other activists in Rochester to discuss what they should do about the recent collapse of the immigration bill in Congress. On Friday, his meetings completed, Mr. Toro boarded an Amtrak train to return to his home in the Bronx. But Mr. Toro is an illegal immigrant. And it was on that train that he was discovered. He was arrested, jailed and then released early Monday morning after posting bond. Yesterday he was home with his wife and daughter, awaiting what is next in his odyssey. 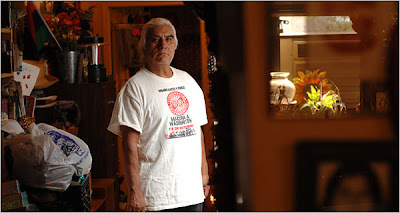 It began in the 1970s when he was a political prisoner in the jails of Gen. Augusto Pinochet in Chile, veered for a time into Europe and Mexico, then into New York City, where he became known for more than two decades of community and political activism. Belatedly, Mr. Toro now plans to seek political asylum, but where he once feared only Chile, he said he now fears the United States as well. Washington, DC--(HISPANIC PR WIRE)--July 11, 2007--LATINA Style Magazine, the premier magazine addressing the needs of Latina professionals in the United States, is pleased to announce the availability of $5,000 cash awards for Latina entrepreneurs. Since its establishment in 2002, the Anna Maria Arias Memorial Business Fund has been the most respected and coveted business award program for Latina business owners in the United States. 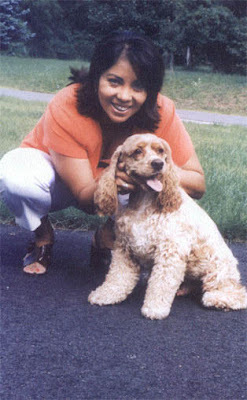 The Fund was created to recognize the accomplishments of Anna Maria Arias, the late founder and editor of LATINA Style Magazine. Her drive and mission to empower Hispanic women is one of the true legacies in the Hispanic community. The Fund celebrates this spirit of entrepreneurship that was Anna Maria’s vision and that today serves to fuel the phenomenal growth of the Latina business sector. We look forward to receiving hundreds of applications this year. The award recipients will be showcased during a gala awards dinner at this year’s LATINA Style Annual Symposium taking place in Washington, DC on September 6th, 2007, at the Washington Hilton in our nation’s capital. For more information or to apply for the Anna Maria Arias Memorial Business Fund visit http://www.latinastyle.com or call 1-800-651-8083. Also see Anna Maria Arias: Remembering A Latina Trailblazer. Given the high concentration of Latino children attending low quality public schools, it's clear that we must do a better job around in order to get a better bargain for our school tax dollars. 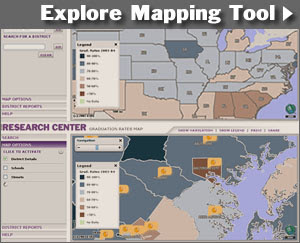 One terrific tool to all Americans at no cost is the Editorial Projects in Education Research Center's New District Graduation Rate Map Tool. Produced in collaboration with the Redlands, Calif.-based ESRI, this Web-based application allows users to easily map out graduation rates by zooming in on any of the nation's individual school districts. Users may then download a special report for the district, with detailed information on graduation rates that includes an analysis of where students are lost from the high school pipeline. The reports also compare district results with state and national figures. What you'll notice is that schools vary tremendously in their ability to graduate students. Oftentimes, schools with similar demographics in nearby neighborhoods or schools districts achieve dramatically different results. So when you shop for a new home, make sure you also shop for the better schools. Even if you don't use the local public schools, the better the local schools, the better your real estate investment. A GOP rebellion widened this week as more of the party's senators voiced dissent from President George W. Bush's strategy. Republican unity on Iraq has shattered in recent weeks, amid mounting pessimism about the ability of US forces to bring stability to the country engulfed in a sectarian civil war. Weakening Republican support for the war has left GWB increasingly isolated as Democrats prepare for a new round of votes aimed at forcing a US withdrawal.